I volunteer for a homeless ministry, I'm one of the leader for Team Hope. My good friend runs this ministry and it was at one of her outreaches where she met Mariah. Myself, Allen and Mariah volunteered at one of the homeless outreaches about a year ago. Mariah loved being of service and she really love helping the homeless. I received a text message from Heather on December 4th the day before we served the homeless; it reminded me of who Mia really was on the inside and how big her heart was. 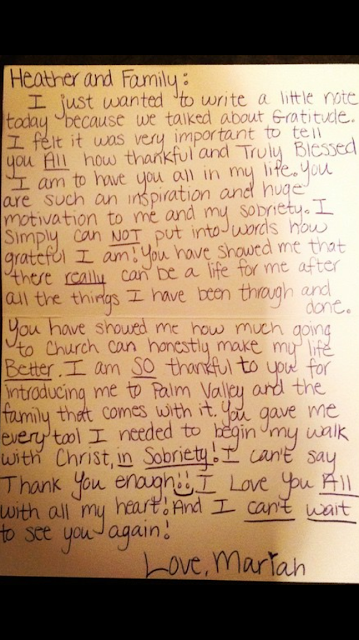 It was a letter written by Mariah to Heather. (Her mentor) This heart felt letter was written one year ago this month and at the time this letter was written Mariah was a resident at Crossroads for woman recovery center in Phoenix, AZ. Heather decided to share this letter on Facebook, she wrote the following.